← Will Chinese tourists save the American economy? The Hilton Hotels & Resorts and Starwood Hotels & Resorts Worldwide have decided to market their venues to Chinese travelers with the comfort of home. Both hotels plan to have on staff one Chinese–speaking employee, a tea kettle and slippers in each room, and traditional Chinese breakfast items such as congee known as rice pudding. And don’t forget the chopsticks! This new plan was unveiled this week by both hotel chains in hopes to appear to Chinese visitors in the U.S..
Chinese mainland visitors has more than tripled since 2000 and is expected to triple again by 2015. The Hilton Los Angeles/San Gabriel has already been catering to Chinese visitors earlier this year for three months and the program will continue since approximately 30 – 40 percent of hotel guests are Chinese. “This will definitely draw more tourists from China,” said Tan Yejun, a businessman from Shandong who was at the Hilton hotel in San Gabriel this week to consider investment opportunities in Southern California. He said the most difficult part about visiting the U.S. is finding locals who speak Chinese, requoted from a Los Angeles Times article. To make Chinese visitors feel welcome, Hilton Hotels will offer welcome letters in Chinese and television sets will include Chinese language channels. Starwood Hotels will translate a packet of local area information for shopping and sightseeing into Chinese for visitors. Chinese travelers are the fastest–growing foreign group to visit the U.S. and they also the biggest spenders. According to the U.S. Commerce Department, Chinese visitors spent an average of $6,243 per person per visit including airfare last year. Chester Chong, president of the Chinese Chamber of Commerce of Los Angeles called the hotel’s plans “very, very smart” regarding interpreters at the hotels because Chinese businessman visit the U.S. nervous regarding the language barrier. “It makes me feel more comfortable that the employees and even the waitress speaks Chinese,” said Ji Wei Ping, a visitor from Shanghai who was speaking through a hotel interpreter. Starwood Hotels operate 1,051 hotels worldwide and 75 hotels in China because it has become the fastest–growing hotel market. The company has approximately 100 more under construction and will open a new hotel every two weeks in China. Hilton Hotels will be debuting the program at 43 of the Hilton brand’s 540 hotels and at four other affiliated hotels starting August 16. 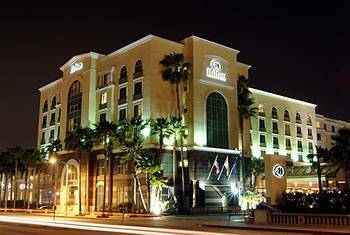 The hotels will include the Hilton Los Angeles and the Hilton Anaheim. Since the Hilton Los Angeles/San Gabriel was launched, hotel’s general manager Carl Bolte said the food, slippers and other extras have won favorable reviews from Chinese guests. Los Angeles is the second most popular travel stop in the U.S. for Chinese visitors. New York is the number one tourist destination for Chinese tourists. Chinese Tourism in Los Angeles is great because it creates lots of jobs, including my own job. Our business is travel entertainment ipads and we rent mobile broadband hotspots and ipads primarily to tourists visiting the city. Any growth in tourism directly helps the economic prosperity of Los Angeles. I welcome it. We try to market our business as much as possible to Chinese tourists.